Detection of a roof leak is often the most difficult aspect of the repair. A roof leak can be difficult to detect because signs often cannot be seen from inside the home until the problem is fairly advanced. However, early detection is the key to avoiding extensive damage to your roof as well as preventing a serious mold problem in your home. Not only can mold do further damage to your home, it can lead to numerous health problems, as well, including asthma, allergies and respiratory infections. You can learn more about the health risks associated with mold in the home. Because early detection is so important, we recommend inspecting your roof regularly and addressing any signs of a leak right away. If you do discover any damage to your roof or a leak, don’t put off dealing with it. Make sure to get any roof leak repairs done as soon as possible to prevent additional damage to your home. The most obvious sign of a leaky roof is water stains on the ceiling. If your home has an attic, water stains may not be noticeable from the rooms below unless or until so much water damage results from the leaky roof that the ceiling of the rooms below becomes damaged. You may only notice water damage above if you go into the attic to check. You may also notice water stains on walls where water coming in through a leaky roof runs down the inside of the wall. Stains may appear yellowish or brown in color. A musty odor in the home is a sign that there is mold somewhere. That mold could be above the ceiling and the result of a roof leak. If you smell that characteristic odor of mold, you should inspect your home carefully to locate the mold and the cause of the mold growth. You should also be concerned about a possible roof leak if you notice missing or damaged shingles. Even if you see no signs of a roof leak inside the house, missing or damaged shingles may cause a leak during the next heavy rain. Allstate, a company that offers homeowners insurance along with other types of insurance, recommends inspecting your roof at least once a year as well as after any extreme weather such as heavy snow, heavy winds or hail. Of course, you should also inspect your roof – or call in a professional to inspect it – if you have noticed signs of a leak. We do not recommend climbing onto your roof to inspect it yourself. Likewise, we do not recommend attempting to repair a roof leak yourself. Without the proper safety equipment and the know-how to navigate rooftops safely, the risk of serious injury is too great. Even for professional roofers, the work is risky. According to the Electronic Library of Construction Occupational Safety and Health (ELCOSH), an average of 37 professional roofers fall to their deaths each year. The average homeowner, without the extensive safety training of professional roofers and without safety harnesses and other safety gear, is at a much greater risk. You may be able to get a look at your roof from the ground using a pair of binoculars. Look for missing shingles or shingles that appear damaged in some way. If you notice shingles on the ground after a storm, that is an obvious sign of a problem. For a complete inspection of your roof, however, we recommend calling a professional. The professional can do a thorough inspection and can then repair the roof leak if any leaks are found. We recommend not attempting roof leak repairs yourself because of the danger involved, as explained previously. If you have a leaky roof or any damage to your roof, or if your roof needs to be inspected, we suggesting calling a professional. A roofing professional will have the necessary safety equipment and will know how to do the job safely and correctly. To find experienced professional roofers in your area, just follow the link. If you have homeowners insurance – and we hope all homeowners do – your insurance may cover repairs to your roof. It will depend on the cause of the damage to your roof and the specific coverage your policy provides. Call your insurance agent if you have any questions. 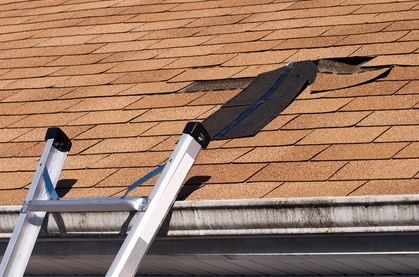 A professional roofer should be able to assist you in filing a claim if needed.